Heavy Seas Beer	Halethorpe, Md. Our quest for great beer can lead anywhere, from corner pubs to faraway breweries. 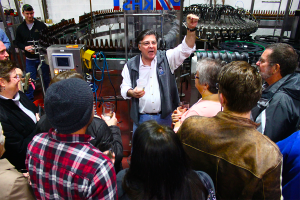 For Heavy Seas Beer founder, Hugh Sisson, beer altered the trajectory of his life. In 1980, intending to become a stage actor and director, Hugh’s plan was to move to NYC after completing his coursework for a masters degree in theater. Hugh’s father, Albert, a Baltimore area businessman, persuaded him instead to come “help” at a newly opened family business, a tavern called Sisson’s. Just after walking in, he was thrown the keys, and told to not screw up. Thus, launching his life into the beer world. Those roots in small business, and beer have been a life-long passion which can be seen in the progression of the brewery. From that pub to now leading one of the largest craft breweries on the east coast — Heavy Seas is fearlessly independent. In a time where other large craft brewers are taking on unique investments to scale, Heavy Seas has carefully plotted growth by making sure every step forward is one that is good for Heavy Seas, the employees and the people that love our beer. It is clear that to be an independent means that you have to “do without” all the resources. Many brewers that have sold to the multinationals have all of those beneficial resources – access to and lower cost of raw materials, capital, production capacity, distributor focus and clout with national accounts. But along with the good comes the fact that they are captive to the rules of the game set by their masters. Remaining independent is hard but rewarding. The Heavy Seas brand is about risk taking and rising to a challenge, but to be successful in most endeavors you need to temper the reckless impulse to just plunge in with a certain measure of patient consideration. We want the beers to have bold flavors, but we follow our own compass in producing beers that don’t follow trends or fads. Each word that is deeply rooted in our passions, and vision for how we can create craft brews that capture your sense of adventure. Don’t live a boring existence. Be Fearless. Don’t settle for the ordinary. Be Bold. Don’t let others define who you are. Be Independent.